OUTDOOR LED DISPLAYS RESEARCH. IT IS GOOD TO KNOW. Dynamic led displays / led signs provide an effective eye-catching advertising medium. People do not stop any more to have a look at static billboard or displays, because this type of advertising tools is everywhere, so they do not bother to look what is on it. Our brain reacts to something new, unique and to movement. Just think how easily you notice a modern neon advert in a shopping window, but it is only a lighting advertising tool. Our eyes have learnt from thousand of years to catch any movement - this is our human subconscious response. "Harris poll – Silicon View" research has shown that 94% of people passing digital billboards can recallthem while only 43% recall static, non-dynamic, billboards. Digital billboard advertising is proven to be 6 times more effective over static billboard advertising. 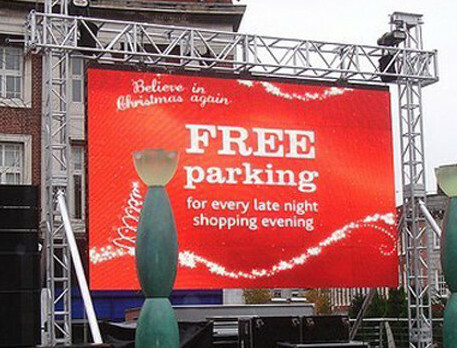 Our advertising LED Billboards have much stronger light than neon and movement is created by software (animations). "Profit - Why use Signage"
Outdoor electronic led displays, led billboards have proven to increase business 15%-150% (Small Business Administration) at 10% the cost of TV, Radio and Newspaper advertising. "Outdoor advertising is effective and priced just right for a growing business. So why isn't yours using this time-tested medium?" By Kim T. Gordon - www.entrepreneur.com"
"One advantage of Dynamic Digital Signage over printed materials and static signs is the ability to change messages in “real time” and enable just-in-time marketing implementation. Another advantage is the unlimited content that can be posted at every display location, which is particularly valuable when space is at a premium. Display sites can also be networked together so that store managers can select target sites demographically and tailor their messages to that audience. Product and brand promotions can now be done in a more efficient manner and at a much lower cost compared with traditional ways." "If those numbers jump out at you, just watch what happens when you add a little movement to the sign. POPAI research suggests thatmotion in POP advertising displays results in greater retailer receptivity (70 percent of retailers would choose motion over non-motion) and higher sales at regular store prices (an 88 percent average gain above normal sales). Why are retailers buying into motional signage? Because it gives them the ability to control distribution of content, inform customers of current information about products, services and specials, educate consumers on products and services, entertain customers while they shop and advertise the latest products. These factors combined are what lead to the 88 percent sales gain demonstrated in the POPAI study. "